Getting at a complex issue like domestic violence requires an understanding of how change actually happens. 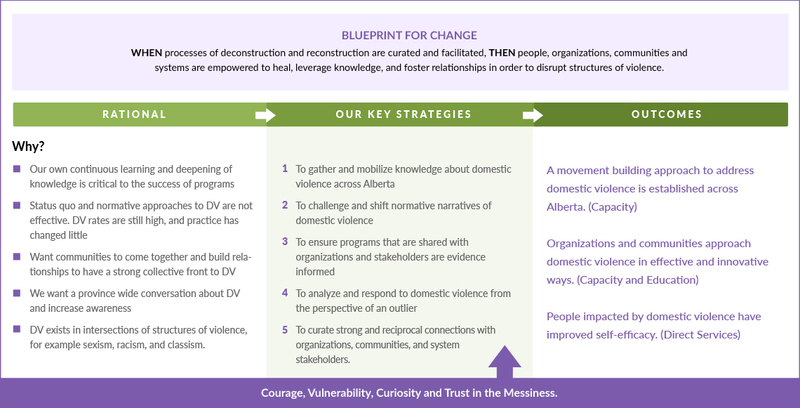 The Blueprint for Change reflects our thinking about the causal linkages between domestic violence and other issues, and what conditions need to be in place, in order to create actual change. Status quo approaches to address domestic violence are not effective. Domestic violence rates are high, yet programs and practices remain static. The intersections of structures of violence are intrinsically linked to domestic violence (i.e., sexism, racism, classism, etc.). When people, organizations and systems come together to develop meaningful connections, it sets in motion a process of renewal, restoration and rejuvenation. We asked ourselves, what if we facilitate and curate processes of deconstruction and reconstruction, could we effectively disrupt the structures of violence? It is this hypothesis that leads our planning and decision-making at Sagesse. The Blueprint for Change connects the dots – and keeps us grounded – around why we choose certain activities and what we are trying to accomplish. It’s bold. And we wouldn’t have it any other way.